Creating the illusion of perspective (space and depth) in art has a long history. Renaissance painters are credited with revolutionizing the world of two-dimensional art by introducing linear perspective into their paintings in the early 1500s. This allowed them to realistically portray three-dimensional scenes within the confines of a two-dimensional art form. In a painting, linear perspective is achieved by using a central vanishing point where all lines converge. The illusion of perspective is further enhanced by reducing the sharpness and saturation of distant objects. This mimics the effect of haze or mist in the atmosphere. Forced perspective is distinct from the linear perspective technique developed during the Renaissance. It is used in photography and dioramas (and sometimes architecture as well) rather than in paintings. In photography, forced perspective is used to change the apparent size of objects in the frame by juxtaposing them in a certain way. This is often used to comic effect. 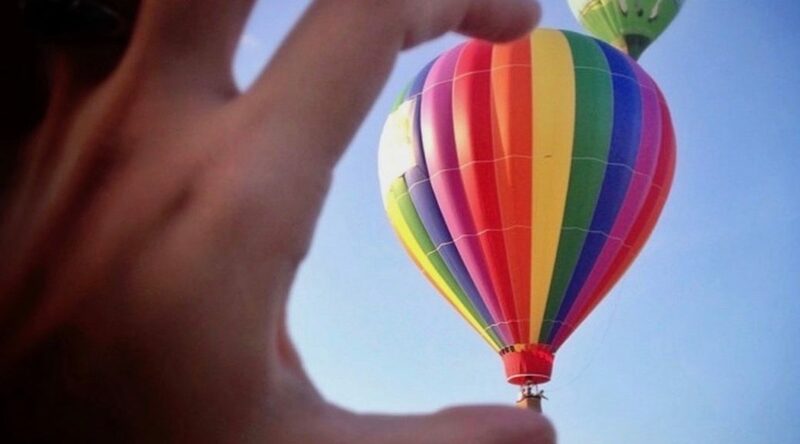 In the above photo, a thumb and forefinger have been positioned in front of the camera so they appear to be pinching a hot-air balloon. Since dioramas are three-dimensional, you may be wondering why a special technique is needed to enhance perspective. The answer is that dioramas have size restrictions. Let’s say you want to create a diorama of a car in 1:24 scale on a highway receding into the distance. An ordinary diorama would require a great deal of space for the highway. It could take up an entire hallway in your house. But with forced perspective, you’d be able to dramatically reduce the amount of needed space. In dioramas, forcing perspective is done by changing the shape of the object you’re portraying. In the case of the highway, you would accomplish this by modelling the highway in 1:24 scale at the front of the diorama and a much smaller scale (perhaps 1:240) at the back. The highway would gradually decrease in width going from the front to the back of the diorama, creating the illusion that it’s much longer than it actually is. The benefit of forced perspective is that you’re able to achieve a grander representation of space and depth in your diorama, while still keeping the footprint of your display to a manageable size. This comes at a a price, since modelling objects in forced perspective is time consuming. There are no commercially available forced perspective model kits. A building rendered in forced perspective, for example, has to be built from scratch because it’s not square. Since it’s so labour intensive, forced perspective is not often seen in dioramas. I’ve recently started using forced perspective as a way to make my dioramas more visually dramatic yet compact in size. I’m currently working on a pair of forced perspective projects featuring legendary WWII fighters. The first showcases the Messerschmitt Bf109 and the second, the Supermarine Spitfire. The 109 diorama is nearly finished, and I’ll be discussing it in an upcoming post.